Falafel is a very popular snack from the Middle East. 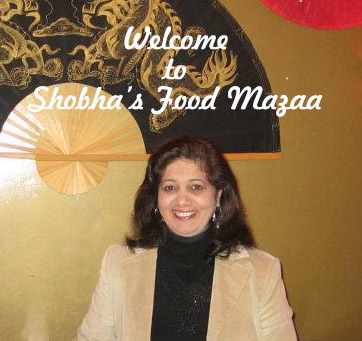 It is made from soaked and coarsely ground chickpeas and spices. You can have it as a snack or stuffed in pita pockets with lettuce, tomatoes, onions and hummus. Gram flour ... 1-2 tbsp. Baking powder .... 1/2 tsp. 2. Mix the gram flour, baking powder and leave it in the refrigerator until you fry. It becomes a little thicker. Add the salt just before frying because salt leaves out water and makes the dough watery. 3. Make lemon sized balls, flatten them a bit and deep fry to a golden colour. 4. 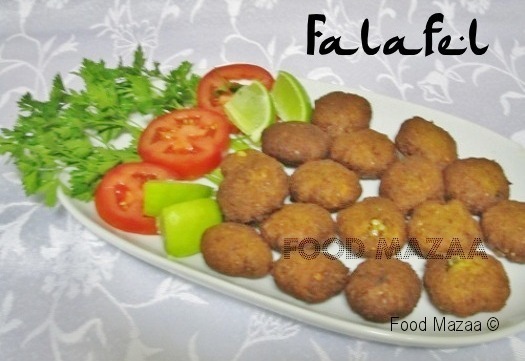 Falafel can be served as a snack or a sandwich in pita pockets along with hummus or garlic sauce, onion, tomato, pickled vegetables, lettuce/parsley. Hello Mam just landed in your blog and found some lovely recipes. Do visit my blog in your spare time. Thank you so much for visiting and liking my recipes. Will surely drop by and check out yours too. How are you? Opening blog after 6 months! As soon as I landed at Algiers I am reading missed recipes..Never tried to make Falafel now feeling enthusiastic after reading your recipe. Adding salt at the last moment is a great tip, never occurred to me before! I think it should be valid for most frying where watering out of the mix is not good! Have a nice weekend...will be home day after tomorrow to read all the missed ones. Thanks for always appreciating my work.. It really feels nice to know when someone appreciates. I can understand being away from home you must be missing home food. So flavorful and love your recipe! Nice recipe I like chickpeas.. Thanks for linking up to Blog Hop Saturday! I intend to hold this every first Saturday of the month, so the next hop will be on June 2nd. The Linky will open Fri June 1st from 8:00pm - 11:59pm EST Sat June 2nd. Invite your friends...everyone is welcome...hope you will join us! Ha ha Andy.. thanks for liking them... you are most welcome to have them all. Yum - one of my favorite foods! I am still working on perfecting a "non-fried" version but loathe the baked ones. It seems pan-frying may be the only acceptable alternative but I am not done testing recipes yet. Any tips? Alyssa, I personally feel that there is a lot of difference in the taste of the non-fried recipes. Once in a way there is no harm in indulging and enjoying the fried stuff. Sweet and fond memories always linger in your minds.